McKendry (nee Kane). April 14th 2019 suddenly at the Causeway Hospital, Emma, 5, Leyland Drive, Ballycastle, dearly loved wife of the late John, much loved mother of Danny, Fiona, Sandra, Leslie and the late Ann, a very dear grandmother, great grandmother and sister and very dear friend of Ray and Caroline. Funeral from her home on Wednesday at 2.45pm to Ramoan Parish Church for Service at 3.00pm, burial afterwards in Ramoan Presbyterian Graveyard, Moyarget. 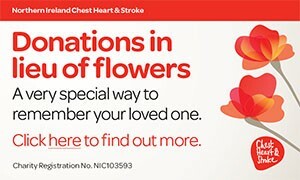 Donations in lieu of flowers, if desired, to Chest, Heart & Stroke c/o DJM Robinson & Son. 121, Culcrum Road, Cloughmills. BT449DT. Lovingly remembered and sadly missed. I am sorry to tell you that Emma McKendry has passed away.